The life and work of Galileo are representative of a defining point within the Renaissance when theology, philosophy and science all collide. In Galileo's will, he indicated his wish to be buried beside his father in the family tomb. Unfortunately, his relatives feared that this would provoke opposition from the Church. His body was concealed and only placed in a fine tomb in the church in 1737, by the order of civil authorities, but still against the wishes of many in the Church. Only in 1992, 350 years after Galileo's death, did Pope John Paul II give an address on behalf of the Catholic Church in which he admitted that errors had been made by the theological advisors in the case of Galileo. He declared the Galileo case closed, but he still did not admit that the Church was wrong to convict Galileo on a charge of heresy, because of his belief that the Earth rotated around the sun. 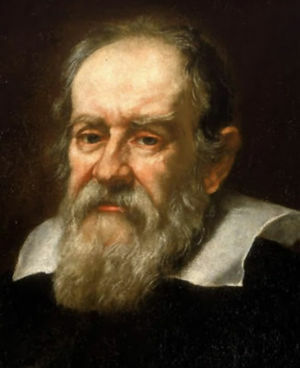 Galileo was born in Pisa, Italy in 1564. At this time, the Catholic Church was not unduly concerned with the Copernican theory, because it was perceived only as a mathematical model, which enabled the calculation of the positions of the heavenly bodies to be made more simply. Therefore, it was not perceived as an alternative interpretation of reality, which contradicted the Holy Scriptures in respect to the structure of the universe. This was to all change, when in 1616, Galileo wrote a letter arguing against the philosophy of Aristotle. In essence, his argument implied that the Holy Scriptures could not be a literal interpretation, when it clearly contradicted facts about the physical world proved by mathematical science. Galileo then goes on to state, quite clearly, that the Copernican theory is not just a mathematical tool, but also a new interpretation of the reality of the physical universe. As a consequence, Pope Paul V ordered that the church's theological position on the Copernican theory is clarified. After the cardinals of the Inquisition took `evidence` from theological experts, their decision was to condemn the teachings of Copernicus. Later, in 1624, Galileo began to write his famous work called `Dialogue`. The work takes the form of a dialogue in which the arguments between the Copernican system and Aristotelian philosophy are debated. However, shortly after publication, the Inquisition banned its sale and ordered Galileo to appear in Rome before them. Galileo is only accused of breaching the conditions laid down by the Inquisition in 1616. The truth of the Copernican theory was never an issue, as it was simply taken as fact that the Copernicus's theory was false, as the judgement of the church had already been reached in 1616. Found guilty, Galileo was condemned to life imprisonment, but the sentence was carried out somewhat sympathetically and amounted to house arrest rather than a prison sentence. Galileo is eventually allowed to return to his home near Florence, but had to spend the rest of his life watched over by officers from the Inquisition. He died in 1642 still condemned of heresy. One of the observations made by Galileo was the feature of dark spots on the surface of the Sun, i.e. sunspots. He reported these in a paper called `Discourse on floating bodies` published in 1612 and more fully in `Letters on the sunspots`, which appeared in 1613. These observations were to raise problems of an aesthetic nature, because they contradict the concept of `perfection in the heavenly region', in the sense that sunspots, craters and a fragmented galaxy of stars are more representative of features of imperfection. While planets with phases are possible in a geocentric model, for a planet like Venus to change in size with its phases is impossible, if the planet is in a circular orbit centred on the Earth. Equally, if all bodies orbit around the Earth, then the moons of Jupiter, which clearly orbit around another planet, went some way to proving aspects of the geocentric model were wrong. The concept of motion in terms of velocity, which is speed and direction, through the use of inclined planes. The development of the idea of force, as a cause for motion. An understanding that the natural state of an object is rest or uniform motion i.e. an object's velocity does not change in the absence of a force. Objects resist change in motion, i.e. inertia. Objects fall with the same speed regardless of their mass, if air resistance is not a factor. The contribution made by Galileo to the enlightenment of the renaissance was enormous and reflective of a mind that could not be totally shackled by the dogma of conformity.